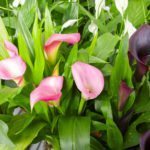 Our calla lilies are rangy 3 - 3.5 feet in length, turning yellow and falling over from weight! The blooms lasted all winter and spring and were plentiful and beautiful. Then they started to fall over after a heavy rain for several days. We held off watering and the leaves have remained but there are fewer of them. They were rotting. I pulled out all the rotted leaves and flowers. They were transplanted a year ago to a more moist soil beside the house, 15 feet of an 18-inch bed and in a morning full sun location. Soil was just amended with horse manure and new topsoil before planting last year. Now they look horrible!! What to do now!? Here is a link that should provide some help.